Architect Ole Scheeren collaborates with film-maker Apichatpong Weerasethakul to create a space where film and architecture meet in Sharjah’s historic centre. The cinema provides a unique setting for a program of film screenings curated by Apichatpong Weerasethakul as part of the Sharjah Biennial. 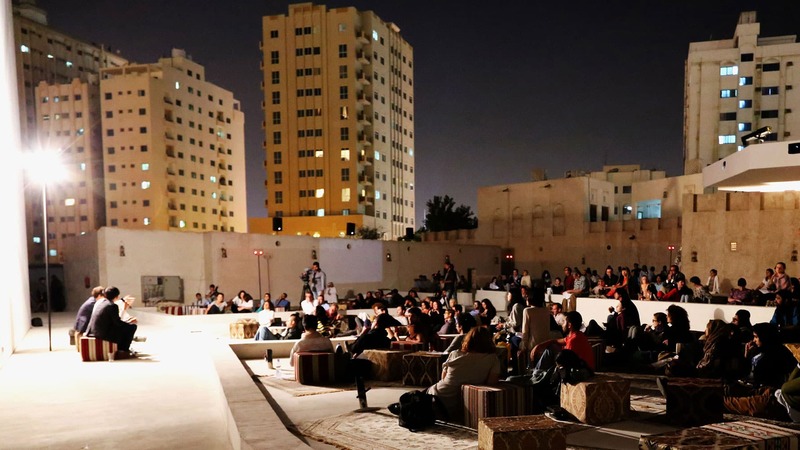 Mirage City Cinema interweaves elements of Sharjah’s historical fabric with filmic scenarios to create an ethereal courtyard cinema experience. Inspiration is drawn from the historical traditions of Sharjah. Floor carpets, which were traditionally used for sleeping and relaxing, are scattered around the courtyard; this draws upon the common practice of using carpets to sleep on rooftops – a tradition now largely defunct due to the prevalence of air-conditioning units occupying roof space. Coral, which was formerly mixed with mud plaster to build the outer walls of houses and whose use as construction material is now forbidden, is recycled from decaying walls and used for the ground of the cinema space. The fragmented shape of the cinematic space, and the choreography of projection and sound from different directions create a sense of disorientation and surrealism. The idea of sleep, dream and memory is central to the project. This is the second time Ole Scheeren and Apichatpong Weerasethakul collaborate to create unusual and surprising cinematic experiences. In March 2012, Scheeren designed Archipelago Cinema, a floating auditorium which premiered at the inaugural edition of Thailand’s Film on the Rocks festival, curated by Weerasethakul and Tilda Swinton. Previous projects by Ole Scheeren which transcend the boundaries of architectural production include, among others, the Marfa Drive-In (a drive-in cinema in the desert of Texas), and the exhibition Cities on the Move, which Ole Scheeren co-curated and scenographed in Bangkok in 1999. Curated by Yuko Hasegawa , Sharjah Biennial 11, Re:Emerge – Towards a New Cultural Cartography takes place from March 13 – May 13, 2013 in Sharjah, UAE. The Mirage City Cinema is a cinema-architecture space by Apichatpong Weerasethakul and Ole Scheeren, commissioned by Sharjah Art Foundation as part of the Sharjah Biennial 11 Film Programme curated by Apichatpong Weerasethakul.